Woo Hoo - I've got internet for today and I've downloaded a couple of pics so here's the the first day's log on our road trip! Leaving the cabin and tree house behind, we're hitting the road. 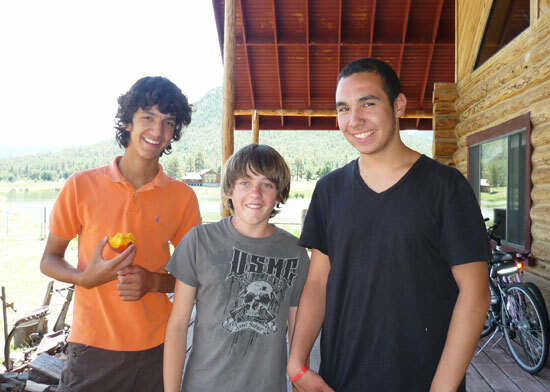 As we pass the Drachman cabin we pull in and let Logan pose for a snap shot with his good friend's Sammie and William (Logan's the short one in between the twins!). We say our goodbye's and get on our way! 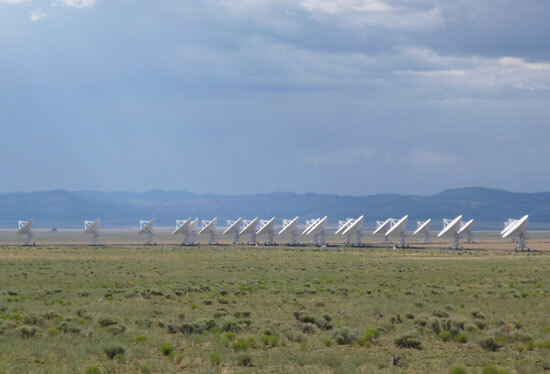 We roll into New Mexico and our first stop is the VLA's. If you've never seen them - they're quite a sight! 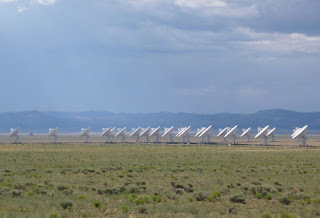 We take some quick shots of the Very Large Arrays and then it's back on the road, headed for our next stop - Roswell, NM, where we're hoping to get some cool aliens souvenirs and possibly bump into a few Aliens and hear of their great adventures before heading on down to Carlsbad Caverns NM. 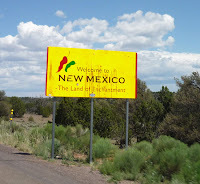 As we drive through New Mexico and pass Lincoln, Mike and I comment that it's so beautiful, we wouldn't mind coming back through for a visit and possibly checking out land to purchase. And then,....chug, chug,....chug, chug,......stop. The RV decided it's time to rest since we like Lincoln so well. So, 2 miles out of Lincoln and still about 50 miles from Roswell we're stuck for awhile as we try and figure out what's up with the RV. Mike thinks it's just bad gas (no I didn't feed the RV beans while at high altitude - I swear!) and as we get the RV started back up and slowly make our way through the mountains a nice sherriff stops to let us know there's no services close by and if we get stuck, to pull off as far as we can so we don't get hit by any semi trucks running through - oh, and to look out for snakes, too! So, Mike and Logan out vote me and we keep going from pull out to pull out, as the RV is trying it's best to stay running. Finally, the lights of Roswell are in our site and we decide to pull into the first gas station we come to in town and put some gas in the RV. As we're filling her up, she just stops cold - not to start again!! After calling Gieco and arguing with them for 30 minutes as to whether we have emergency road side assistance or not - "Oh, I do see that now Mr. Buettner - someone entered it incorrectly into your policy. We're sorry about that. We have very few people working this late at night and the whole RV department has gone home." (Gee, sorry to break down after hours - we'll try to plan it better next time so as not to inconvenience you!!!) we line up a tow truck to come get us out of the parking lot. 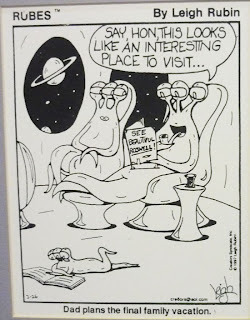 However, we're not sure where they're going to be able to take us to as all the garages in town are closed and will not open again until Monday morning,......and it's Midnight Saturday night/Sunday morning (In Roswell, NM!!). Finally, after many more little 'incidents' between Gieco and the nice towning people (seriously - they were great. It was Gieco that wasn't the easiest to deal with at midnight,....might be time to change to a different insurance company after all these years!!) 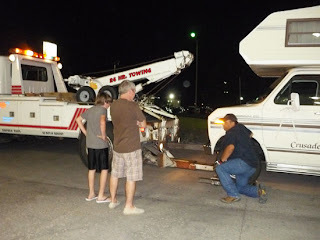 we got towed into a great little RV Park in Roswell (Town and Country RV) at approximately 1:30a.m. Sunday morning - oh our poor RV neighbors!! 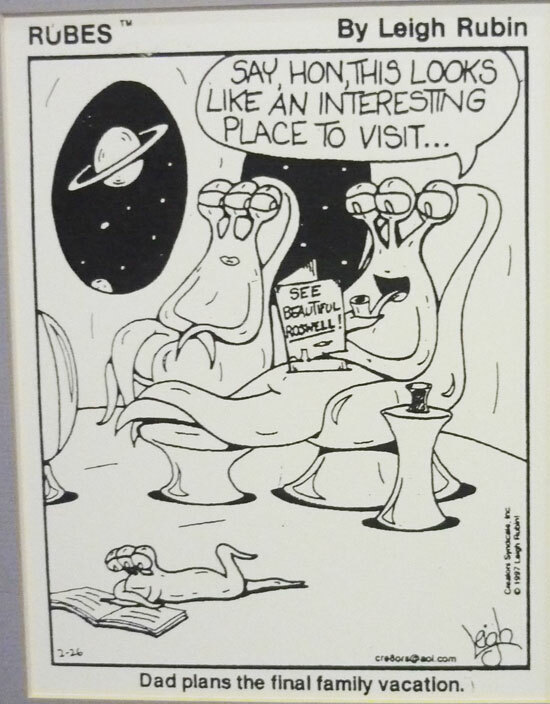 All settled in and ready for some much needed sleep and relaxation, we drift off to dream land wondering what tomorrow (in Roswell) will bring! Stay tuned as the adventures just get better! Peace, Love and Thank You Freddie from Remco Towing - you're fantastic!! Travel Tip #2: Always remember to try and break down between the hours of 8:00a.m. and 5:00p.m. Monday - Friday so you can better accommodate your insurance company.